Yesterday I was contacted by a knitter called Sheri who was knitting my Mrs Tumnus shawl design and had just reached the short row shaping section and found herself a bit stuck, so she had dropped me a line for some clarification. After a couple of emails back and forth it seemed to be not a problem with the instructions for this particular pattern, but rather the concept of knitting short rows which was causing the confusion as Sheri hadn’t knitted them before. 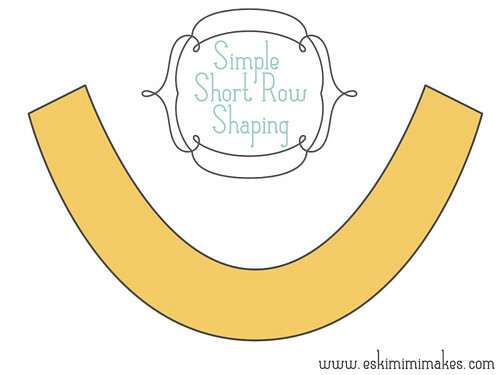 It was past 10pm in the UK and I was ready for bed, but I promised Sheri that today I’d try and write a quick post to give a very basic introduction to the concept behind short rows. Short rows are so called because the knitter does not knit the full length of the row. Instead, they stop short before reaching the end of the row, ready for the work to be turned and knit back again. There are many ways of working short rows and many applications for their uses. 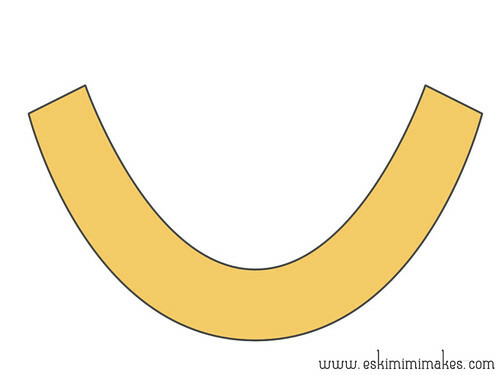 You can use them to make fabulously smooth sock heels and toes, add bust shaping to fitted garments and to shape and form all manner of wonderful knitted projects, but one thing they do most fabulously is to help a knitter form curves. Mrs Tumnus is a curved shawl that is essentially knit in two stages. Firstly the lace border is knit from side-to side, producing a wide, shallow piece of knitting that borders the shawl. The illustrations below do not specifically relate to the Mrs Tumnus shawl but could represent any shawl of a similar construction. The bottom edge is the cast-on edge and the top edge is still on the needles. To help visualise where the live stitches are, a dotted line has been added to the illustration. Think of each of these dots as a ‘live’ stitch, still on the needles and ready to knit. This is the point in the pattern at which the knitter begins the short rows. The important thing is to just trust in the pattern. Short rows can seem like a strange idea at first, and completely against what most knitters have been taught to do up to that point, but they do make sense once they are seen to work and they are so handy that they are worth the leap of faith. Starting the first short row as normal at point A, knit the number of stitches that the pattern dictates up to point B – this will not be the full number of stitches left on the needles. There will still be stitches on the left needle after knitting the required stitches – this is perfectly correct and those remaining stitches can be ignored for now. Once point B has been reached, turn your knitting. Literally turn it around so that the other side of the work is facing you. If the last row was a right-side row, the ‘wrong’ side of the knitting should now be facing the knitter. The knitting will now carry on in the usual manner from that point. Often a pattern will tell the knitter to slip the first stitch after a short row. This helps avoid unsightly holes and distorted stitches in future rows. Again, trust in what the pattern is telling you to do after the work has been turned. In the case of the short row shaping on a shawl with a construction like Mrs Tumnus, the pattern will then give the instructions to knit a specific number of stitches before turning the work once more. In the illustration above (which represents the wrong side of the work as it has been flipped over, just as the knitting has) this second short row begins at point B (where the work was turned after the first short row) and ends at point C, after the required number of stitches have been worked. Again, this will not be the end of the knitting – this isn’t a mistake. Just turn the knitting over as instructed by the pattern, and the second short row is completed. Pause at this moment just to consider the knitted fabric. At the two points where the work was turned and the first stitch of the new short row was slipped there will be a small but noticeable ‘gap’ between the last stitch of the short row and the stitches that went un-knit. This is neither a mistake or a problem, and will actually be used to form the remaining short rows. From this point on the short rows start to build up, each getting slightly longer than the previous row. The third short row begins at point C and ends at point D, which is further along than the first short row reached. However, on the way to point D the knitter will find a small ‘gap’ caused by where the work was turned on the first short row and the first stitch slipped. Many patterns will instruct the knitter to close this gap by working a decrease with the two stitches either side of where the gap lies, which serves to further shape the shawl. A similar technique is used when turning the heel of a pair of socks. After this decrease has been completed, work the number of stitches given by the pattern before turning the pattern for the next short row. As the short rows build row upon row each line of stitches will grow steadily longer and the curved shaping of the shawl will become more pronounced to give a lovely curve to the finished item. These are one of the simplest forms of short rows to work. Other forms of short rows may have the knitter working ever-shorter lines of stitches that need to have a little extra work and attention to prevent unsightly holes and weak spots, but they all have the same ultimate aim – to shape and form the knitting, whether it be in the formation of curves or 3D shaping techniques. Slightly more complex short row shaping techniques can be found in the post Short Rows For The Sock Enthusiast, fully illustrated and covering the whys wheres and hows of how to best use short rows when knitting socks. My latest discovery – German short rows. Super easy and super good. I’ll never go back to anything else. Thank you for this. There’s a free video tutorial about short rows on Craftsy.com which might be helpful for people who need to see something done. I really like the diagram you provide showing how short rows build upon one another as well as the reminder to trust the pattern. Short rows are hard to grasp at first and can be hard to explain but you did a great job. This is really helpful as I was struggling to understand the short rows in my pattern. Thank you for sharing this .. I am a visual self learner and this was perfect!! I am working on a different shawl right now and made it bigger… Is there a way (formula) to figure out where to start short rows by the number of stitches or something? In instances like this it is usually best to contact the designer of the shawl as it will alter the depth and curve of the shawl. Usually you can just maintain the same rate of short rows through the short row section, though. That is exactly what I’m trying to figure out as well! Any luck?